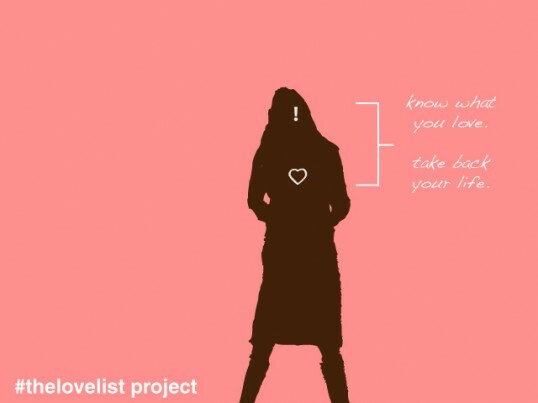 Note: Although a “love list” might sound girly, this is not a project just for females (and it’s not for couples)! It’s for any individual who wants to identify and then claim more of what they love in their lives. OK, now that I got that out of the way, I can start sharing some details. In Wednesday’s post, I brought up the idea of a “love list,” a list that you make over time detailing the things you love most in life—the things that make you feel most content in the world, and most like you. Then a few others caught wind of this love list idea, and asked what it was all about. Even though these lists need to be individual and personal, I began envisioning a way to work on them together, sharing and encouraging one another along the way. Here are some random thoughts I’ve come up with so far (but I really need YOU to help me shape how this might work, so speak up!). - Start making your love list. My writer friend Julie Hammonds, who introduced me to this concept, taped several pieces of paper together on her pantry door, where she could see her list grow (she also used crayons and color to express moods and themes). You might want to carry around a small notebook, or keep a list in your iPhone. The important thing, I think, is to add to the list as moments strike you, not to sit down and brainstorm or try to write as many things on it as you can in one sitting. Any time you feel completely filled up with the goodness of something you just did or something that happened—something you saw or heard, or an interaction—add it to the list. - Push your list deeper by asking why. For instance, I might write on my list “I love interacting with people who leave comments on my blog” (I really really do!). And that’s a fine thing to put on this list, but then I should probably push myself to identify what I love about it: I love sharing and hearing stories; I love connecting with new, interesting people; I love knowing that in some small way I’m helping others sort through their complex lives. I would also put this on my list: “I love taking care of errands on foot or by bike.” But what’s at the heart of that? First of all, living in a neighborhood that makes that possible. Second of all, having enough time in my day to tackle my errands at a slower pace. And I think I just love the feeling of accomplishing something that I need to do, like go to the post office or store, in a way that exposes me to neighbors, sights, and time to think and stretch my limbs. - Share parts of your list on Twitter (or Facebook). If you are already on Twitter, you probably know how hashtags work—they create a link to a list of every tweet that includes that hashtag. For this project, the hashtag will be #thelovelist. Those of you on Twitter can join me in either share an item or revelation from your list, or you can create some of your list through your tweets. For instance, yesterday I tweeted this: “makin me happy: a delicious lunch (a papusa and a salad) with one of my favorite friends.” I was thinking about how whole I feel after I’ve had a chance to spend time with someone I can completely be myself with, and I thought, “That’s a big love list item for me!” Next time I tweet something like that, I’m going to include #thelovelist hashtag. Most importantly, do you think making a love list will help you take back your life? If you feel like digging deeper, try answering these questions. You can do it on your own or with a friend or spouse; you can keep your responses to yourself or you can share some of them here with us. 1. Think back to a time when your day-to-day life was markedly different in some way than it is today. What made it different? How did you feel about it? What did you enjoy/not enjoy about it? 2. Can you think of any pivotal moments, when you knew you had to change something negative or claim something important to you? What happened in that moment, that made it pivotal? 3. Even though you probably weren’t creating a formal Love List at the time, when you look back, when were major life decisions impacted and driven by what you love most in life? When did you find yourself setting aside what you loved? 4. What does your life look like today? Better, worse or just different? What’s responsible for making it better/worse/different? 6. What kinds of things have been showing up on your Love List these days? 7. How might you make real changes in your life, based on what you love? 8. Do you have any wisdom or advice to share with others? Thanks for your involvement in the Love List Project. I can’t wait to hear from you! Sitting, occasionless, on my apartment balcony, looking at south-east asian jungle, smoking a fat one, listening to McKenna rap about the hyperreal object at the end of time. I found your blog through Rachel Held Evans and I am more thrilled I did than a kid who just woke up to the news school is cancelled because of a snowstorm! I adore the love list idea and will add to it on Twitter. I’m addicted to Twitter…hmm that could be my first addition! I love your candor. Without candor, the world would taste like saccarin! Thanks for your candor, without candor I think the world would taste like saccarin! Ah, Kristin, I’ve finally found my way to your blog. I saw you briefly at the Festival of Faith and Writing–you were meeting with Rachel Evans, her and I had just met in person–but I only just now found your blog randomnly, and I’m so glad I did. I love the love list idea. Awesome. I love, randomnly, that you branded sprout for PBS. Right when sprout came out for PBS, I had “branded” our children’s ministry sprouts. I feel strangely connected, and like this is a slightly creepy comment. I love that you love your readers and creating community here. Awesome. OK, I”m feeling like a stalker, so I’ll stop now. Looking forward to more conversations here! Kristin, I know, I feel EXACTLY the same way about my readers, but still I like to introduce myself, especially since I’ve actually seen you before and remember Rachel talking about how excited she was to meet you! I’d like to carry the Love List onto my blog…wanna repost something you’ve written about it and then I’ll link over to you?